Liberty Girl, a Norman Rockwell painting, appeared on the cover of The Saturday Evening Post published September 4, 1943. This is another timeless favorite of Rockwell collectors, a classic for the ages. An alternate title for this painting is Rosie to the Rescue. This painting was Rockwell's fourth cover for The Post in 1943. In 1943, there were five Norman Rockwell Saturday Evening Post covers published. This was also Rockwell's 216th cover illustration out of 322 Rockwell painted for the Post. Rockwell's career with the Post spanned 47 years, from his first cover illustration, Boy With Baby Carriage in 1916 to his last, Portrait of John F. Kennedy, in 1963. The location of the original oil on canvas painting is currently unknown. However, a charcoal on paper study , 41 x 31 inches or 104 x 78.5 cm, is currently part of the collection of the Norman Rockwell Museum of Stockbridge Massachusetts. This painting also appears in one Rockwell commentary books. It appears on page 155 of Norman Rockwell, A Definitive Catalogue by Laurie Norton Moffatt. One of the photographs that were taken during the production of this painting, as well as the painting itself, are reproduced in Norman Rockwell: Behind the Camera by Ron Schick on pages 58 and 59. I have seen pristine original copies of this magazine cover sell for well over one hundred dollars on eBay. And to think it only cost ten cents originally! And it was mint condition then, too. This version of "Rosie" is apparently working very hard. She is working very hard just to carry all her tools. Of course, all those tools are just a visual device for Rockwell to convey just how important a part the women at home played for the United States during World War II. If the women at home had not pitched in, the soldiers on the front lines would have run out of ammunition, clothing, boots and food. The women were the engine tha allowed to war to be effectively waged. As many occupations as Rockwell has depicted in this painting, there is no doubt that he left some out. There is not enough room on the canvas to fit it all in. The women did too many jobs for them all to be painted on one canvas. and what looks like a typewriter on her back. It also looks like she will be delivering milk as well. Se is wearing two hats. One is a nurse's cap. The other looks like a rail conductor's hat. Rosie looks to be straining under her load. And yet she keeps pressing onward. She wears the colors and design of the American flag. Her uniform looks dirty and grimy. There is still work for her to finish before she can clean herself up or let herself worry about her appearance. 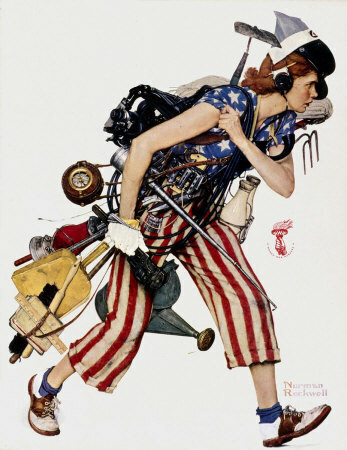 This classic Norman Rockwell painting shows a World War Two era woman shouldering the load at home during the war. Liberty Girl was only one of 322 Norman Rockwell Saturday Evening Post covers; Here is the list of Norman Rockwell Saturday Evening Post cover illustrations. The little red icon with the hand holding the liberty torch on the right side is captioned "Women War Workers." Rockwell painted many pictures illustrating World War Two. None actually showed combat, nor did he put his characters in harm's way. And yet he still captured the struggle of America at war in his paintings. This is a more gritty depiction of World War 2 era woman than Rockwell's more famous Rosie the Riveter. Do You Have A Great Story, Opinion Or Contribution About Liberty Girl? Do you have a personal story about Liberty Girl? Do you know the model personally? Do you have a different take on the commentary?